It's OK to stalk your date in 2017? Allow me to let you in on a little secret. 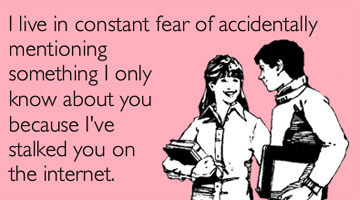 One of the things that cause the greatest downfall for those involved with online dating….and dating in general. Two words: Social Media. We all know that the proliferation (Word of the Day successfully used!) of technology gave a rise to social networking. There are various kinds of SNS users. The people that never log on, the watchers, the actively engaged user and those that use it as an emotional outlet. Did you write a monologue on how much Nutritional Yeast has become life? OR where it is - for the thousandth time - you get your protein from. This along with whatever personal information you post up there will seal your fate. On top of this a 42% of singles said they judge a date by their social media posts. Whether they then tell their date that they have cyber followed them to the darkest depths of the internet is debatable. Would you regard it as creepy or “kinda sweet” that they’ve taken an interest? So, the takeaway of today’s post is: project unto the world the best you! - Or, you know, if someone does stalk you online beforehand and still likes you for you, they’re a keeper.